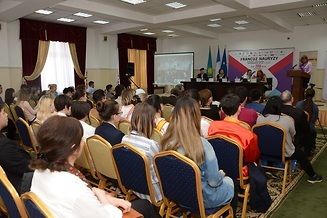 On 9 April, 2018, in support of the initiatives of the Republic of Kazakhstan and UNESCO for the implementation of the International Decade for the Rapprochement of Cultures (2013-2022), as well as the development of social programs, in particular digital education “Digital Kazakhstan”, an international online conference "The Concept of Dialogue in the Modern World: philosophical comprehension and practical application" was held. The conference was co-organized by UNESCO Cluster Office in Almaty, the Kazakh-Indian Foundation, the Institute of Sorbonne-Kazakhstan at the Kazakh National Pedagogical University named after Abay, the Institute of Oriental Studies named after. R.B. Suleimenov MES of RK. The conference was held in online format with the participation of speakers from China, France, India, Kazakhstan, Russia and Tajikistan through online communication on the basis of the Institute of Sorbonne-Kazakhstan (ISC). The main purpose of this event was to intensify intellectual and academic discussions to address issues related to the concept of dialogue and its practical application. 3) dissemination of the best practices and practices in the field of intercultural dialogue in the system of secondary and higher education, in particular, using the online platform on "Intercultural Dialogue" as a unique innovative digital resource that has no analogues in the world yet. The issues of understanding the concept of dialogue in its normative and specific meanings, used in various cultures, today become extremely important. Their practical relevance is related to the application of the concept of dialogue in the educational process. In particular, it is necessary to intensively develop the use of advanced digital innovative methods and practices in the system of secondary and higher education. A unique project has been launched in the Republic of Kazakhstan - the creation of an online platform and an interactive training manual on "Intercultural dialogue". To disseminate the best practices within the framework of the conference, the online platform on "Intercultural Dialogue" was presented among a wide range of stakeholders involved in the system of secondary and higher education for its subsequent use as a system resource in the educational, creative, popularization and educational processes. The innovative format of the online platform is the same as that of a quality-like hub, it includes various materials for interactive teaching, reading, research, discussion, development, in particular, educational tools, articles, presentations, lectures, speeches, tutorials, e-courses, educational, video / audio materials, blogs, links, forums, labs and creative work, etc. The online platform for intercultural dialogue is a pilot project in the digital space (regional and global), the first generalizing experience covering various aspects of the dialogue. Both the content and the mechanisms of implementation are directed at transforming the platform into a special area of the dialogue, aimed at inclusiveness and sustainable development, confronting the modern challenges of narrow thinking, exclusivity and radicalism. Creation and development of digital content through intercultural dialogue, especially in the cultural, educational, research and information spheres, now acquires a special dimension and is a development priority in many countries of the world. In the modern world, intercultural understanding, management and dialogue skills are extremely important, whether it concerns issues of social cohesion in society or the fight against radicalism and radical ideas of violence and intolerance. Thus, the online conference significantly contributed to the search for answers to these calls.